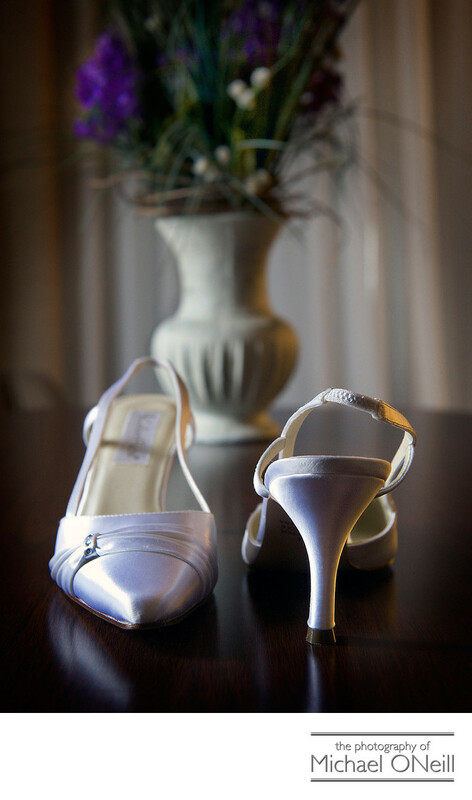 Another fine detail shot of a bride’s shoes. Colorful shoes are all the rage these days. Traditional white wedding shoes have been replaced by deep rich ruby reds and dark indigo blues. This pair was in a very delicate pastel violet color which complimented the flowers on the vase behind them. The bride loved this picture because it showed both the front and rear details of the shoes that she had carefully picked out as the perfect compliment to her amazing wedding dress. The bride wore these shoes well for her wedding ceremony and a photo session at Old Westbury Gardens in Nassau County, Long Island. After the first dance in the ballroom at The Glen Cove Mansion she slipped into some comfortable white shoes more suitable for dancing and spent the entire night on the dance floor with her new husband, their friends and families.